Councilmembers Mark Salinas, Sara Lamnin. Three Hayward officials received nearly maxed-out contributions from the powerful pro-landlord California Apartment Association (CAA) and affiliates last year, according to campaign finance reports released earlier this month. At a special Hayward council meeting last week focusing on rental housing affordability in the city in which councilmembers voiced support for alleviating the housing crunch, some activists found the contributions discordant with their rhetoric. “I question your capacity to make decisions that goes against the best interest of your campaign donors, but I do hope to be proven wrong this evening,” Hayward resident Alicia Lawrence told the council. 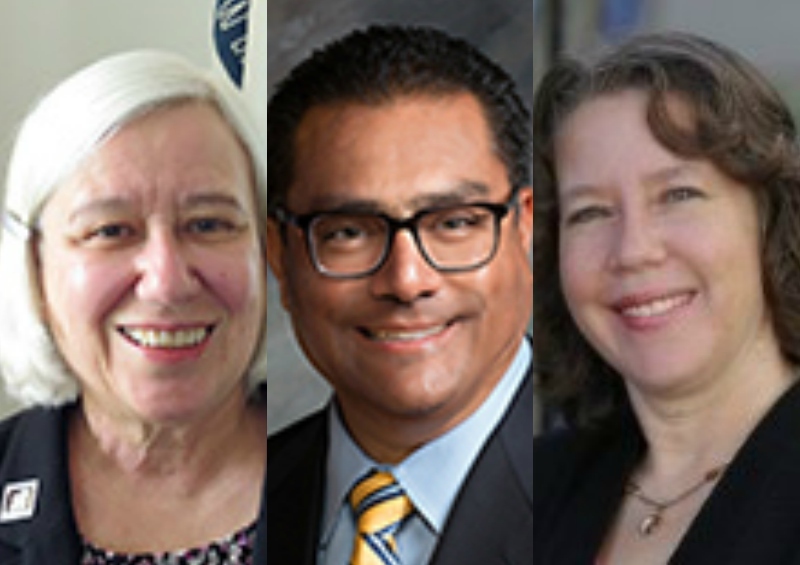 The elected officials running for re-election who received campaign contributions from landlords include, Hayward Mayor Barbara Halliday, who is running for re-election and Councilmember Mark Salinas who is challenging her. Councilmember Sara Lamnin is seeking re-election to one of two open at-large seats on the City Council. Local housing advocates from the Hayward Collective used last week’s hearing to push for a menu of short-term proposal to stem the current plight of city’s renters, including emergency moratoriums on rent increases and no cause evictions. Both types of moratoriums have been either adopted or proposed in other East Bay cities, including recently in Alameda. In the Alameda’s case, some of the same special interests who made campaign contributions to Hayward’s public officials, successful defeated moratoriums and subsequent ballot measures related to rent control. While Halliday, Salinas, and Lamnin lamented the city’s rental housing predicament last week, campaign finance reports show pro-landlord special interests behemoths thus far represent some of the largest stakes in their respective campaigns this November. Halliday received $1,338 from the Rental Housing Association of Southern Alameda County, which is linked to CAA. Real estate investor Tom Silva and Castro Valley Chamber of Commerce President Bill Mulgrew are also affiliated with RHA. Both spoke on behalf of Hayward property owners at last week’s meeting, advancing similar sentiments around the cyclical nature of the rental housing business. Lamnin, who is up for re-election for the first time, is a somewhat unlikely choice for CAA. Her 2014 campaign was extensively funded by SEIU Local 1021, a labor union most would not readily identify with a candidate financially backed by real estate interests. Mulgrew also threw in another $100 from his own pocket to Lamnin’s campaign last year, according to finance reports. CAA appears to be hedging its early bet on the Hayward mayoral race. While RHA gave to Halliday campaign last year, CAA gave a similar amount to Salinas, according to finance reports. Despite a pipeline of new units coming online in coming years, Hayward renters, though, have been feeling a considerable pinch. One-bedroom would required roughly $73,000 a year in income. And since Hayward’s median income is around $68,000, more than half are not able to afford a one-bedroom apartment. Rents are also increasing in Hayward due to supply and demand, although the dynamic is by no means unique among other cities in the Bay Area. Posted in Barbara Halliday, Bill Mulgrew, California Apartment Association, campaign finance, Hayward City Council, landlords, Mark Salinas, Rental Housing Association, renters, Sara Lamnin, Tom Silva. Bookmark the permalink.